Welterweight Ray Robinson, 20-2, 9 KOs, returns to the ring after an 18-month layoff to headline the second-ever boxing show at the Sugar House Casino. Robinson will face Santos Benavides, of Nicaragua, 25-10-2, 19 KOs, in the 8-round junior middleweight main event promoted by Hard Hitting Promotions, at the Northern Liberties gambling venue. Robinson, a 10-year pro, was on the brink of fighting on HBO for the first time a little more than one year ago. However, an injury suffered in an auto accident prevented him from fighting and kept him on the shelf until now. "I feel like I was on a roll," Robinson said about life before his accident. "I got the phone call to fight on HBO, but then it didn't happen. It's all in God's plan and eventually it will." Robinson is trained by Germantown's Bozy Ennis, one of the City's best trainers, and their teaming, five or six fights ago, appeared to lift Robinson to a new level in his career. However, management issues as well as his injury stalled his rise. Robinson, now managed by Tom Moran, is eager to make his comeback, but will do so with a whole new perspective. "The layoff got me thinking a lot," Robinson said. "I live more in the 'now' than ever before. I take it all in now and appreciate it all. It's so easy to have something slip away from you. So on Friday, I'm going to take my time and soak it all in. It's a blessing to be back." Nicaragua native Benavides also has a clear cut approach to his fight with Robinson. "I'm really blessed to come from a country that a great fighter like Alexis Arguello, a legendary fighter that is well know in the world of boxing," Benavides said. "But I don't fight for my country. I fight for my family and my kids. I'm here to bring them ahead and to be able to make a living, so they can be better. So, I'm going to put all my work and all my effort into this fight so that I can win and better secure my family." Rated #4 by the WBC, Robinson could be in line for a future shot at WBC welterweight champion Danny Garcia, if Ray can stay active and if Danny's schedule permits. Garcia faces Samuel Vargas on November 12 and is signed to meet WBA champion Keith Thurman in March. 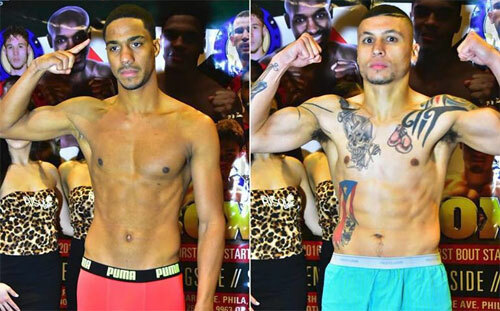 Robinson will need to impress over the next six months to make his case for an opportunity against Garcia. 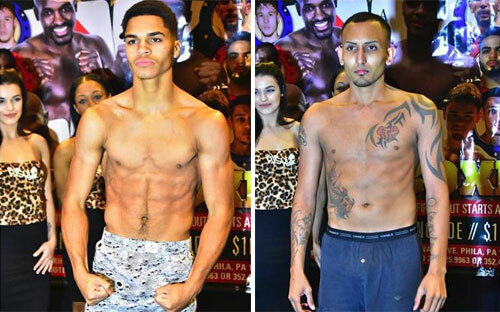 Also on Friday's card is the professional debut of one of Philly's top amateur boxers, Branden Pizarro. The former Junior Olympic champion, 55-5 as an amateur, fights Ezequiel Oscasio, 1-2, in a 4-round junior welterweight bout. Pizarro, a 17 year old 11th grader, is the youngest fighter to be licensed in Pennsylvania in recent years. Branden beat the record of Milton Santiago, who turned pro at 17 in 2014. Santiago, now 15-0, 3 KOs, was a few months older than Pizarro when he was granted his license. "We spar each other all the time," Branden said about his older boxing brother, Angel, also on Friday's card. "We spar each other for a piece of gum in the house. I always got the piece of gum. I've been training my whole life for this (becoming a pro). So leading up to it is an amazing feeling. Seeing my big brother (Angel) get in there and fight as a professional just made me hungrier and made me want to turn pro younger (than expected)." Branden's brother Angel Pizarro, 1-0, returns to the Sugar House for his second pro bout. Angel made his debut in August. Friday, he'll face DC's Maurice Adams, Jr, 1-1, in a 4-round bantamweight bout. "It felt like I belonged in there," Pizarro said about his pro debut two months ago. "As kids, we always dreamed of this opportunity," Pizzaro said about sharing the card with his brother. Bantamweight Christian Carto, 3-0, 3 KOs, goes for win number four against Angel Carvajal, of Chicago, 2-4. The Philly-based Carto has been exciting thus far, bringing a no-nonsense, aggressive style, and posting three straight knockouts. His last outing was also at the Sugar House. "I just let the knockout come, I'm not looking for it," Carto said. Philly's Jeremy Cuevas, 45-5 as an amateur, makes his professional debut against Puerto Rican Luis Ramos, 0-2 in a junior welterweight 4-rounder. "I can't wait," Cuevas said (above right). "Getting an opportunity to fight in front of my hometown and to be able to bring a lot of people out to it, there's no better feeling than that." The 8-round co-feature bout pairs two out of town junior middleweight fighters, Steven Martinez, of Bronx, NY, 16-3, x KOs, and Jeremy Ramos of Colorado, 9-4, 4 KOs. It is the first trip to Philadelphia for both fighters, but Martinez has fought in Atlantic City several times. 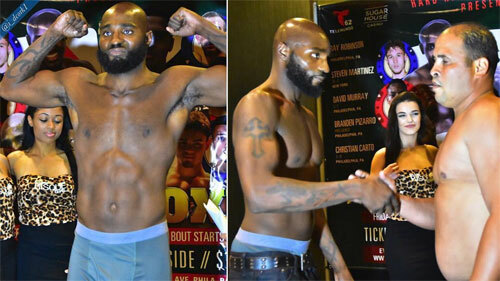 Wilmington's power-punching light heavyweight David Murray, 5-1, 4 KOs, was scheduled to fight his first 6-rounder, but the fight was scratched on the scales when his opponent, Edgar Perez, could not make weight. Hard Hitting Promotions again expects a full house for their second show at the Sugar House. Last time the place was stuffed to the gills and the action was excellent. The first fight is scheduled to begin at 7:00 PM.